Sliding doors on cabinets and wardrobes can be a bit of a headache when it comes to finding suitable locks when you want to add a bit of privacy / security to them. But thankfully, we've got a range of purpose-made locks here for you which will hopefully solve your headache once and for all! 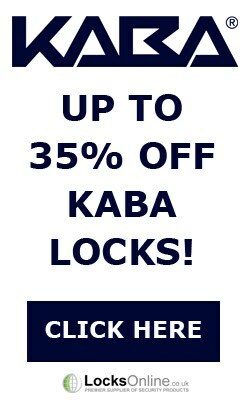 So now that you've finally found this section of locks for sliding cabinet doors, you're maybe thinking to yourself "which one do I go for?". The hookbolt cabinet locks - designed just like a standard cabinet lock, except with a hook-bolt instead of the deadbolt, these are designed to be mounted inside the sliding door and will hook into the cabinet wall that the door closes up to. 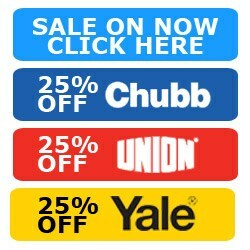 These are ideal for single-sliding doors, but can also be used on double-sliding doors if you're happy to fit one on both sides. The push-locks are designed moreso for double sliding doors which overlap in the middle. These would normally be fitted through the foremost door (the door that overlays the other door) and secured to the back of the door with screws through the fixing plate. When you push the button in, this in turn pushes a small bolt out of the back, which will shoot into a hole you'd make in the secondary door, effectively securing both doors together and preventing anyone from sliding either of the two doors. 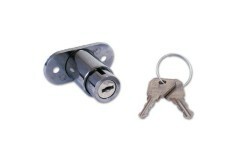 So to recap, for single sliding doors, consider the hookbolt locks for your door. For double-sliding doors, the pushbolt solution gives a single point of locking for both doors, but if you want each door locked individually, choose the hookbolt version as you would for a single sliding door. The Asec no 80 comes supplied c/w strike plate, Not reversible. Hand must be stated when ordering. T.. 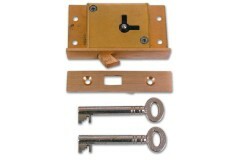 The Asc 85 Sliding door lock supplied c/w strike plate, Not reversible. Hand must be stated when ord.. 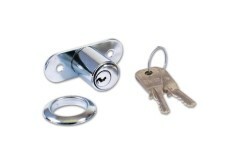 The Lowe and Fletcher 5861 sliding door locks. 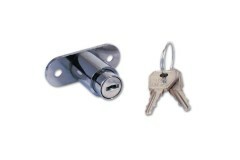 The Lowe and fletcher sliding door lock, easy to push.. 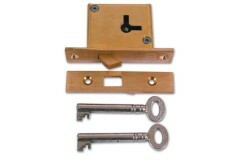 The Lowe and Fletcher 5862 sliding door lock. Suitable for wooden sliding for wooden sliding doors l.. 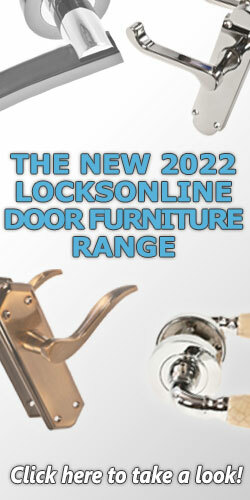 The Yale S230 Sliding cupboard door lock. The Yale S230 suitable for wooden cupboard doors. Easy pus..